Purdue Dining & Culinary is committed to providing allergy education and awareness for students, staff, and the Greater Lafayette community. We are dedicated to our work with students who have food allergies by providing options in all campus dining halls and retail food outlets. Purdue Dining & Culinary is not in a position to guarantee a completely allergen-free environment, rather to minimize the risk of exposure, encourage student self-responsibility, and plan for effective response to possible emergencies. Contact the Disability Resource Center on campus and schedule an appointment to explore options available to you for your housing and dining needs. Email allergicboiler@purdue.edu to connect with Purdue Dining & Culinary. We will meet with you to discuss your questions and restrictions. Our Purdue Dining & Culinary professional staff will share insight into our processes and training for staff. They are also available to answer questions on a daily basis in the dining facilities. Request assistance from the professional and supervisory dining staff when visiting the dining courts or retail locations. Supervisors are ServSafe and AllerTrain certified. Ask questions and discuss your options. Help is available to assist you in managing your dietary needs. It is the goal of Purdue Dining & Culinary to provide you the best dining experience regardless of your restrictions. The Purple Diamond is a meal ordering system unique to Earhart Dining Court. This program offers students with food allergies and intolerances the opportunity to order specially prepared food prior to their arrival at the dining court. Complete the Purple Diamond Pre-Order Form that indicates your allergies, food order, and anticipated time of arrival. Please complete this form at least 3 hours in advance, and no more than 12 hours in advance. Receive an email confirming your order or informing you of problems with the order. ServSafe and AllerTrained certified staff members prepare your meal according to your form submission. Upon arrival at Earhart Dining Court, go to the Purple Diamond located next to the "No Meat No Wheat" station to receive your meal. Foods that likely cannot be modified: soups, casserole-style dishes (lasagna, etc. ), and breaded items. You may eat additional foods available in the dining court; you are not restricted to eat only the food you pre-ordered. Only items requiring modification or special preparation need to be submitted on the form. All food items are labeled with the "Big 8" allergens plus gluten. If you would like to see a full ingredient list, ask a dining court staff member to see the original packaging and full nutrition label. If you have specific allergy concerns or are interested in speaking with a Registered Dietitian, email Molly Winkeler at mwinkele@purdue.edu. Purdue University is dedicated to supporting the needs of our students, staff and visitors. We understand there are some individuals with unique dietary challenges. 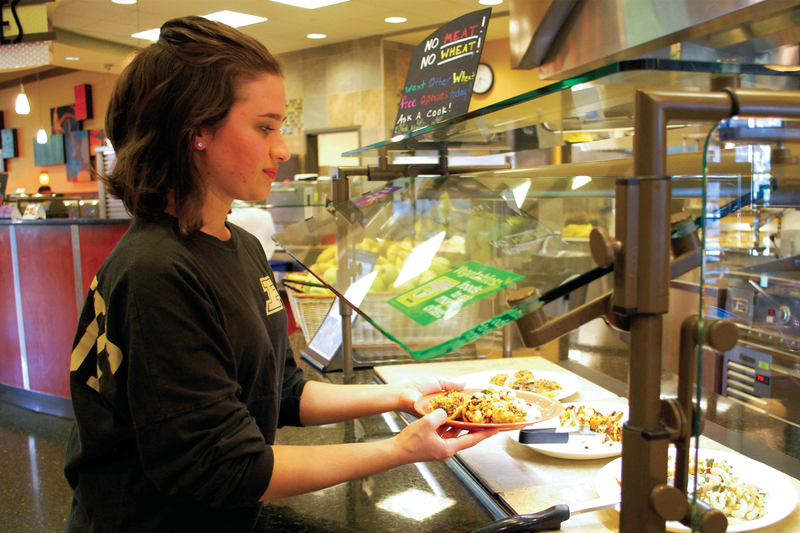 The mission of Purdue Dining & Culinary is to nourish and inspire the Purdue community. In order to help us reach our goal, it is critical all students with food allergies or intolerances contact Purdue's Disability Resource Center before coming to live on campus. It is essential that our food service staff is informed and able to be prepared to serve students with conditions or challenges. This communication step allows Purdue Dining & Culinary time to prepare and provide guests with appropriate dining options. Contact the Disability Resource Center at drc@purdue.edu to let them know about life threatening food allergies if you are going to live in campus residential units. Email allergicboiler@purdue.edu. Let us know if you are coming to live at Purdue in the residence halls for the school year or are just stopping by for a quick visit. View signage and information available in the dining operations and online. The app is available and named “Purdue Menus". If you have any doubt or question about a particular food offered, please request a label or recipe by asking the supervisor for more specific information. It is critical to also avoid any foods in question. Engage with dining staff, by connections made through the allergic boiler email or relating with the staff in the locations you frequent on campus. Use our menus website and posted information available for every menu item. Recognize signs and symptoms of your allergic reaction and know how to use proper medication if a reaction occurs. If you have been prescribed an epi-pen, please carry it and know how and when to use it. Purdue Dining & Culinary staff are not trained to give medication. Cross-contact happens when one food comes into contact with another food and their proteins mix. As a result, each food then contains small amounts of the other food. These amounts are so small that they usually can’t be seen. Even this tiny amount of food protein has caused reactions in people with food allergies. Ask dining employees to use new utensils, cutting boards and pans that have been thoroughly washed with soap and water. Some areas use the color purple to identify the safe kitchen tools to use for allergens. Ask the dining employee to change their gloves. Do not share food, drinks, or utensils with friends. Avoid eating deep-fried foods. Frying oil is reused before being changed; this can lead to cross-contact because food fried in oil releases some of its protein, which is then absorbed by other foods fried in the same oil. Request produce or meat that is stored separately at the salad bar or any other area. Purdue Dining & Culinary makes every attempt to identify ingredients that may cause reactions in people with food allergies. The dining courts, restaurants, and the Purdue Memorial Union kitchens make every effort to safely prepare and serve foods, including those items with peanuts, tree nuts, flour, and seafood. Allergy awareness and training are regular topics at our staff meetings and our food staff have been instructed on the severity of food allergies. Due to the number of meals served and number of items used each day, along with unanticipated changes in food product formulations and manufacturer substitutions, we cannot guarantee that every allergen in the food will be identified and labeled appropriately. While we make every effort to identify nutrition data and allergen information, we cannot assure against these contingencies. Purdue Dining & Culinary does not assume any liability for adverse reactions to foods consumed, or items one may come into contact with while eating at any University establishment. Guests, students, and employees sensitive or intolerant to specific foods (or who suffer life-threatening food allergies) must be aware of the risk of cross contact. Any items “without gluten containing ingredients” are not certified as gluten or flour free. The items are produced in a flour containing environment, but do not contain gluten or flour ingredients. Gluten Free packaged items will be maintained in their original package and labeled Gluten Free. It is the responsibility of the customer with food allergies or sensitivities to make the final judgment on whether or not to question the ingredients of a food item or to choose to eat the food item. Anyone who may need an epi-pen because of life threatening food allergies is highly encouraged to carry an epi-pen. Purdue Dining & Culinary staff are not trained to administer epi-pens. Purdue Dining & Culinary locations do not stock epi-pens for public use.